By default yumex updates its package information on every startup. On the first tab you have options to select packages (optional by category) for update, installation or deinstallation. You can search for packages by scrolling the package lists or simply enter a search term into the corresponding field. If you mark a package by clicking on it, additional information will be shown in the lower area. When you mark the checkbox of a package, the package will be added to the package queue. 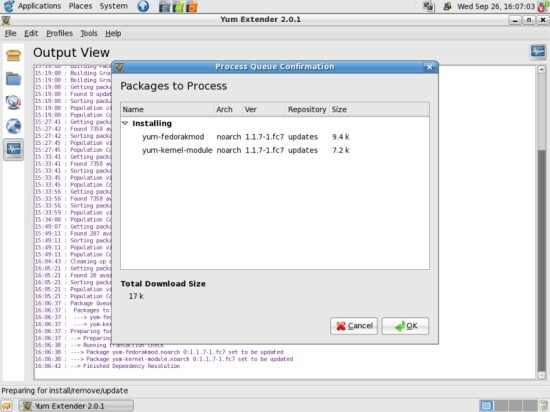 Once you are ready you can execute the operations in the package queue by clicking on the button Process Queue in the lower right corner. The second tab gives you the option to select packages sorted by group. The further handling is almost the same as the first tab - except of the possibility to select recommended packages from a package group by marking the checkbox of the group. The third tab contains the package queue. Here you can see all packages that you selected for update, installation or deinstallation. You can remove packages or simply add known packages via the Quick add to queue field. 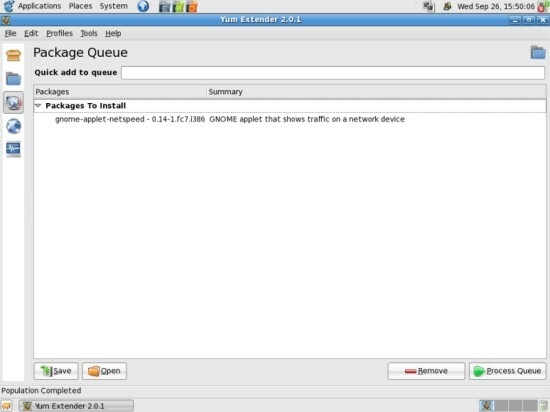 You also have the option to save the queue to use it for other machines or load a queue file that you saved on another machine. The fourth tab shows you all repositories on your system and which are enabled or disabled by default. 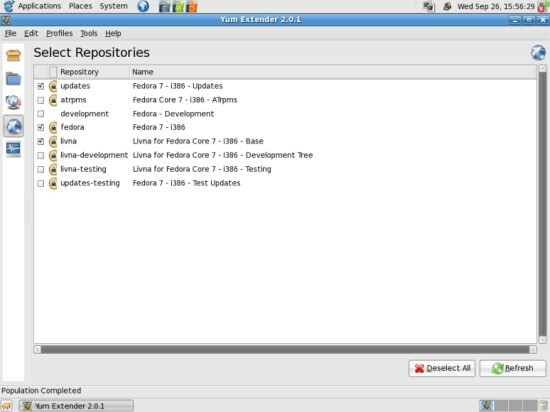 You have the option to enable or disable one or more repositories (temporarily for this yumex session). You have to refresh yumex by clicking the corresponding button at the bottom on the right to make the changes effective. Afterwards the new package lists are available on the tabs one and two. The sixth tab shows you the processing output. You'll be informed about every operation. The preferences are available in the upper menu. The second tab Excludes gives you the option to add packages that will be excluded. You have the possibility to insert wildcards (e.g. : kernel*). 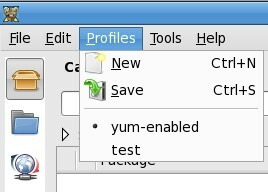 The third tab Plugins shows you all additional yum plugins. You have the option to disable or enable one or more plugins. On the fourth tab GUI you can adjust the settings for the GUI fonts and their colors. The settings for profiles are available in the upper menu. You can add profiles to save different sets of settings. The tools are available in the upper menu. By default there is only one tool available - Yum Clean All. 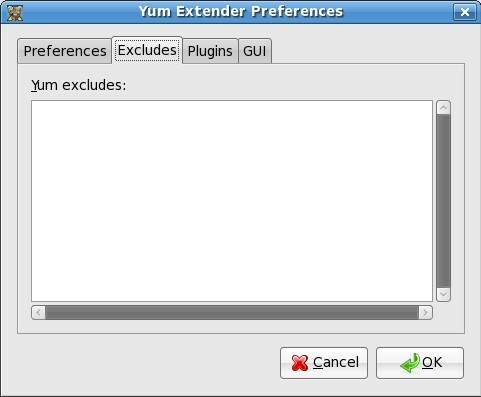 If you click on this button, any cached packages and all of the files which yum uses to determine the remote availability of packages will be eliminated. 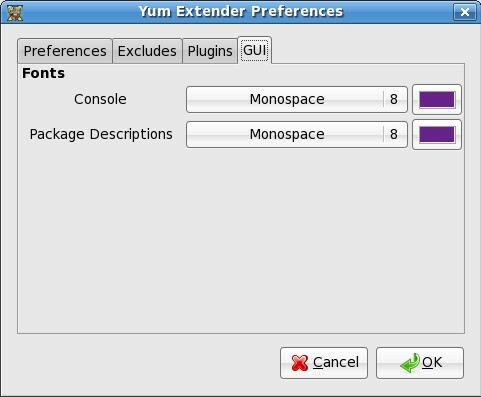 This will force yum to download all headers next time it is run.